Teeka has been very elusive since she was born this May. Today was her first day to be separated from her mother for the late afternoon and evening. The calf & mother honk to each other, and Teeka ran about the pasture honking for Mom after the ladies had left for an evening display and round of reindeer rides at "A Grand Holiday" in Glenwood Springs CO.
Teeka calmed down after a bit and soon was up to her mischievous ways, sneaking out through the pasture gate to visit all the other Ranch creatures. She can't get back in the same method of egress, so she circles the pasture and ducks back in through a drainage, which oddly enough, she cannot escape through. So in & out she played, driving her dad, Magnus, nuts, because he was totally distraught that his bevy of beauties had all left him behind. And then there goes Teeka, off to start some reindeer games with the other animals! 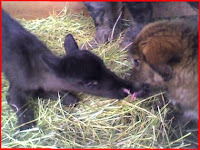 To see how she has grown, here's Teeka when she was just a day old, un-named, nose to nose with young Ruby, about 7-8 weeks at the time. Check out that "Hello World!!!" kiss. What a sweet baby. The ranch sounds so interesting, comfortable and homey. I'm glad you're there. I love reading about everyone's adventures!